In May this year, Skallagrim, the host of the Youtube channel of the same name dedicated to Medieval/Ancient weapon enthusiasts, reviewed an interesting gladiator weapon, custom-made for him, of which I had never heard: the scissor. That’s the item (and the guy) in the image. It is an unusual weapon, vaguely resembling a pirate’s hook, as Skallagrim remarks. However, it is based on an actual gladiatorial weapon. But what was it used for? And was that its actual name? Let’s start off with a look at the sources and the period and place whence this weapon originates. We are, of course, talking about the Roman Empire, where gladiatorial games were held for a very long time, from an unknown starting date, placed by the Roman historian Titus Livy in 264 BC, to the sixth century AD, when Italy was already lost to the Empire and ruled by the Goths. The defeat of the Ostrogoths by the Eastern Roman Empire under Justinian marked the definitive end of the gladiatorial games in Western Europe. That’s some 7 or 8 hundred years to look into, and an enormous territory. But it’s not just a large area: the Empire was never culturally or linguistically homogeneous. So we need to assume that what was true in a period or area might not have been true in another, and that different languages used different names. In general, Latin was dominant in the Western half of the Empire, while Greek was used by the upper classes of the Eastern half, where a number of other languages were also spoken locally (just to name a few that survived until today, Coptic was spoken in Egypt, Aramaic in the Levant, and Armenian in parts of Asia Minor). Anyway, the sources we rely on are of two types: texts and representations. We’ll start off with the texts. The first one is a Greek book, the Interpretation of Dreams by Artemidorus Daldanius. While such a work sounds really psychological after Freud, Artemidorus wasn’t a psychoanalyst, but a diviner who lived in the second century AD. His job was to predict events in the future, and dreams were an instrument to this purpose. He evidently found that he knew enough about them to write a book on the matter. The gladiator type known as thraex. Image by Wikipedia user G.Garitan, distributed accordingly to the CC BY-SA 3.0 license. Not the best of omens, then. The dimachairos (or dimachaerus) was a gladiator that used two daggers. The arbelas (ἀρβήλας), however, isn’t known outside of this work, and the word itself isn’t found anywhere else. The technical name for this kind of words, that only appear in a single work and never again, is hapax legomenon, something “said only once”, and they represent a problem to scholars. That’s because ancient texts almost never reached us in their “original” version, but rather through a manuscript copied from another manuscript that was also copied from a third manuscript, and so on, going all the way up to the original and the author's mind. This means that words occasionally got changed while copying them from a manuscript to the other. A hapax legomenon may then be the result of a misunderstanding, or a mistake made by one of the many copyists that will be transmitted to the following copies. However, in this case, there are reasons to believe that Artemidorus really did write that word, because his work was transmitted to us through two different manuscript families (one of which was a medieval Arab translation), and both contain the same word arbelas. But what did it mean, then? Roger Pack was the first one to connect the kind of gladiator called arbelas with a crescent moon-shaped blade used to cut leather in shoemaking, called arbelos (ἄρβηλος). Now, there is something interesting about the arbelos: the medieval Greek encyclopedia known as Etymologicum Magnum tells us about an item called arbelon (probably a variant of the same word as arbelos), a shoemaker’s knife which is also a hoplon, which means “military equipment”. Pack consequently suggested that the name arbelas referred to a gladiator who used an arbelos as a weapon. File by Wikipedia user Thomas Schoch, distributed according to licence CC-BY-SA-3.0. Pack published his edition of the Interpretation of Dreams in 1963, and it remains the one most in use. However, his proposal about the arbelas wasn’t received very well. In particular, while his arguments undoubtedly make sense, he did not propose any external identification or ancient depiction for the arbelas. Lacking external sources to confirm this theory, many simply kept considering arbelas an incomprehensible or corrupted word. In 2001, however, another scholar, Michael Carter, did publish an article in which he identified some ancient reliefs as depictions of arbelas-gladiators. One is a funerary stele of unknown origin, now in the Louvre Museum. It depicts a gladiator wearing a scale mail (or a quilted tunic), a face-covering helm and wielding a knife in one hand, while the other arm wears a somewhat unusual item closely resembling the one shown by Skallagrim: a metal sliver or very long gauntlet, covering the left hand and forearm, taking a conical shape and ending as a stick to which a crescent moon is attached by the inner arch. Hierapolis, a rich polis in Asia Minor, also has some representations. Links to more images can be found at the end of the article. It originates in Tomis, on the Black Sea. What we see here is a gladiator, of the kind which Carter calls arbelas, who has discarded his weapon (the arbelos), now lying on the ground. Instead, he has grabbed the trident of a retiarius and is fighting him with the knife. Finally, a relief from Patras depicts a few gladiatorial weapons on a funerary stele: a knife, a face-covering helm and an arbelos. We can deduce that these were the weapons of the gladiator who was buried there, and these are weapons of the same kind as we have seen carried by all other users of the arbelos. (Carter, p. 114) So we have multiple depictions of different gladiators, all carrying the same arms in different places, and it makes sense to deduce that they were members of a lesser known, but clearly typified, gladiatorial class. We come then to the following conclusion: the Greek word identifying the gladiator carrying the weapon shown us by Skallagrim was arbelas (the plural is not attested, but is very probably arbelai); the weapon itself was called arbelos (plural arbeloi) or arbelon (plural arbela). But how does it come to scissor, then? Before making his brief lesson about gladiators, Artemidorus noticed that names of gladiator classes were normally expressed in Latin, not in Greek. However, he also said rather clearly that he didn’t like using Latin words, since he was writing in Greek. This actually wasn’t just a personal idiosyncrasy of his: while Greek intellectuals didn’t find it difficult to accept Roman political supremacy, they were fully aware of the fact that Greek had a greater prestige than Latin, which is why the later Byzantine Empire ended up being a Greek-speaking Empire, in spite of historically being the surviving eastern section of the Roman Empire. Anyway, given his brief preamble, it’s probable that Artemidorus deliberately used a Greek word to translate a Latin name. Carter proposes that the arbelas was known in Latin as contraretiarius or contrarete, a kind of gladiator that was usually sent against the retiarius, the kind of opponent we have seen the arbelas fight in the Tomis relief. The weapons of the contraretiarius have never been clearly identified, so it’s possible that they were those of the arbelas: after all, as Carter notices, a weapon like the arbelos allowed to grab the net of the retiarius like a hook, or gave some reach to throw it away. 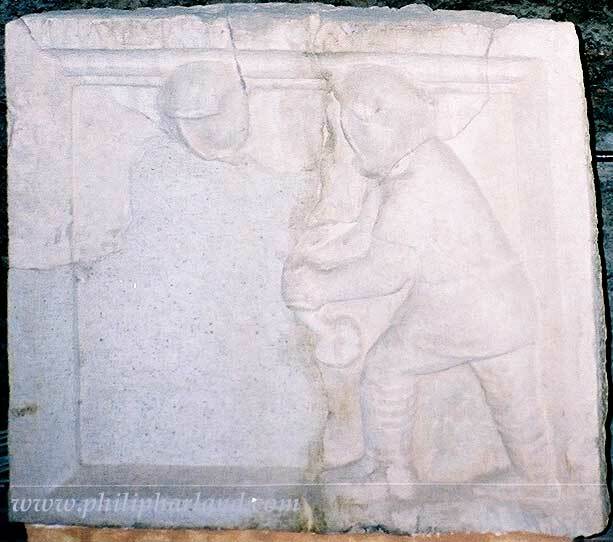 In the Tomis relief, we see that the retiarius isn’t holding the net any more, and the arbelas has consequently discarded the arbelos, now less useful, to free his hand and grab the trident of the retiarius. On the other hand, some reliefs show an arbelas fighting an opponent that wasn't a retiarius, or possibly two arbelai fighting each other, so they mustn't have been fully specialized in exclusively fighting the retiarii. But let’s finally come to the scissor. The name clearly comes from the same root as the verb scindere “to cut” (from which “scission” also comes, if you are into atomic bombs), meaning “cleaver” or “divider”. Now, we don’t have a lot of sources for this Latin name referred to a gladiator: there actually is only one text, a Latin inscription (CIL IX, 466) enumerating the kinds of gladiators available in the school of Caius Salvus Capito. The German archaeologist Marcus Junkelmann proposed this name at least as early in 1987 for a class of gladiators, the same which would be identified in 2001 by Carter as arbelas. Although Junkelmann is a respected scholar and his books are of special importance for experimental archaeology, I personally am not enthusiast of this identification, mainly because I fail to see why that name should be attached to this particular gladiatorial class. The arbelos blade had a distinctive form, which is why the term is still used in geometry, and we can recognize it on the reliefs, but scissor is a very broad term, and the inscription in which it is reported doesn’t really give any reason to think that the arbelas is the same as the scissor. While probably historically unfounded, the use of scissor with this meaning may still be of advantage for us. Telling weapon and gladiator apart from each other isn’t that easy with arbelas and arbelos, especially if lacking a background in ancient Greek and not knowing which pronunciation to use. However, if scissor is used as the name of the gladiator, arbelos can be used as the name of the weapon without fear of confusion. The weapon shown in the reliefs and by Skallagrim can be identified by its Greek name: arbelos (ἄρβηλος), plural arbeloi. Its Latin name is unknown. The kind of gladiator who used this weapon in the arena bore an unknown Latin name. Two guesses have been made: contraretiarius, pl. contraretiarii (and the variant contrarete) and scissor, pl. scissores. While I think that contraretiarius makes more sense, the current use is to call the gladiator scissor. The Greek name for this class was arbelas (ἀρβήλας), the plural likely being arbelai.